The Internet of the future will be about things. The early Internet was about information. Web 2.0 was about people. The Internet of the future will be about things. Driven by cheap sensors, drops in data transmission and storage costs, mobile democratization and advances in AI and machine learning, connected objects are one of the defining trends for the next decade. What started as a curiosity is now attracting the attention of brands of all types, from FMCG to industry. Achieving success with connected objects however means more than just sticking sensors on “things”. Beyond the form factor, the IoT offers tremendous opportunities to transform brand experiences across the entire spectrum. From the consumers’ perspective, connected objects have the potential to change the way products and services are accessed, bought and used. This represents not just an incremental improvement in features but often times a fundamental re-definition of how certain needs are met and how people relate to brands. From a brand perspective, connected products suppose not just technology improvements but evolutions in business models, monetization strategies, pricing and distribution along with important internal changes to brand capabilities and processes. In this article, we try to take a step back from the technology and look at the submerged part of the connected iceberg, considering how brands can seize the opportunities that connected objects offer to build brand innovation. The first key thing about connected objects is that they are about a lot more than just objects; on the contrary, they impact each dimension of the brand experience. To explain this, we have created 3 examples of brands exploring IoT opportunities, mapping for each the implications on the brand experience. Products and Services: Connected objects obviously have a direct impact on what brands sell. Most often, this impact comes from the addition of a software and service stacked on top of a physical product experience. This component can be rolled into the price of the item, but it can also represent a separate revenue stream in and of itself. 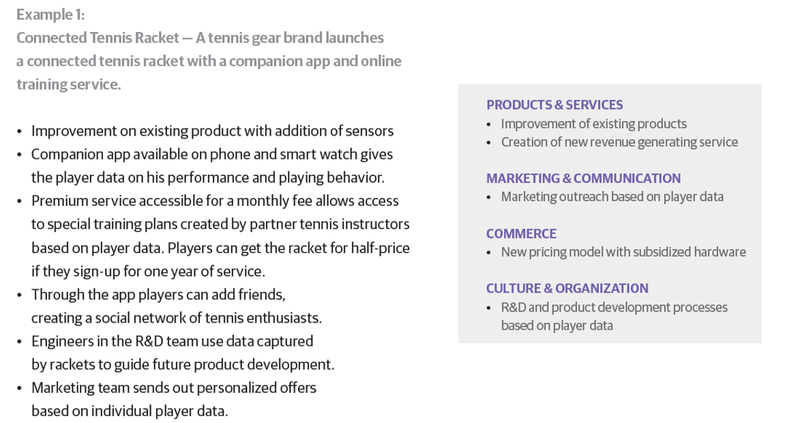 Through our connected tennis racket brand, we can see how the companion application branches out into a new service-based revenue stream for the brand. The ultimate potential of connected objects is the opportunity to explore completely new markets and product offerings, leveraging existing capabilities to reach new customers or serve new needs that are peripheral to the existing value proposition, as shown in our bike rental example. In a similar vein, MADJOR is currently collaborating with a large materials brand to help them translate their existing expertise into a new line of connected products for B2C markets. Most importantly, connectivity means that products and services become living things, constantly being updated to deliver new features and optimize the consumer experience. Just like apps or softwares, they go from fixed items to ever-evolving platforms, forcing brands to adopt new approaches to product development and service innovation. Marketing and Communication: Connected objects offer brands quantities of data that were hitherto simply unthinkable. Who is using your products? How? When? Where? To what effect? In what setting? All of these data points can be accessed in real time and used for highly personalized marketing outreach. The case of the beer brand is an illustration of how connected objects can maximize relevancy and context awareness in marketing messages and achieve greater accuracy in targeting. Connected objects, in particular wearables, also allow for in-depth behavior tracking. Through them brands can gather advanced data on their consumers’ lifestyle and habits along with their reactions to different brand interactions throughout the customer journey. This data can be used to fine-tune segmentation profiling and outreach strategies. Commerce: Connected products are not bought in the same way as traditional products. Thanks to their connectivity features and the possibility of seamless connection with online payment services, they allow for de-bundling and for new, more flexible forms of product access such as subscription and micro-monetization. In many cases, the shift towards connected services will force brands to move their revenue models from ownership to access. We can see through our tennis racket example how even a very simple product can be subjected to a new pricing model once data and services enter the equation. Our beer company case also shows how the very concept of a fixed sticker price can be made obsolete through real-time price optimization based on consumption data. Even in highly complex and conservative industries, the rise of connected products leads to value chain disintermediation with fewer actors, and a direct ownership of the consumer relationship by the brand. Tesla is one of the most high-profile examples of this trend as they have bypassed traditional dealers in favor of direct sales. Culture and Organization: Perhaps the most often overlooked consequence of connected products has to do with brands’ internal culture and organization. With the IoT, every company has the potential to become a data and software company. Even industrial giant GE Power is shifting its business models towards becoming an industrial data business for which turbine performance and usage data matters as much as the underlying hardware. Skills such as UI / UX, data analysis, data security, customer service and more will become critical in the future and will need to be developed. The massive amounts of data generated by connected objects also has a direct impact on business processes. Connected products fulfil the vision of a truly data-driven company where every decision can be optimized. 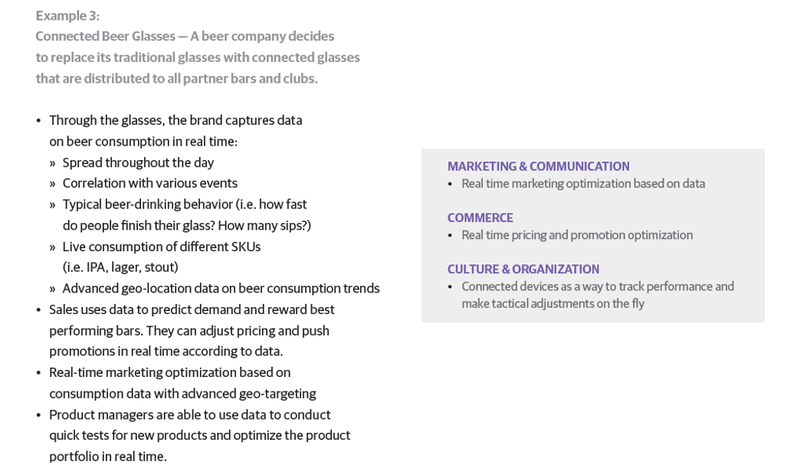 We can see for example how our tennis racket company uses data captured by its rackets to guide R&D, or how our beer brand uses its connected glasses to conduct agile market testing for new products. As with many other technologies, it is too often that brands get carried away and forget about the age-old rule:“Just because you can, doesn’t mean you should”. Too many connected products suffer from featuritis and do not answer any real customer needs. MADJOR recently conducted an in-depth research about the future of the smart home. A consistent piece of feedback from consumers was that most existing smart home products do not offer any sort of added value over traditional alternatives. They simply digitize existing features in a gimmicky way, such as replacing a remote with a smartphone app, without providing additional benefits. Monitoring — how can we use connectivity features to offer customers data that they want and need about their environment and their product or service usage? Control — how can we use connectivity features to allow users to control and personalize their experience more easily? Optimization — how can we use connectivity features to increase product performance and improve it on an on-going basis? Automation — how can we use connectivity features to allow the product to operate on its own based on user behavior and needs? As we have shown before, brand development in the field of connected objects means more than incremental feature adjustments. Connected objects and their accompanying data-based services offer new ways for brands to serve consumer needs, forcing brands to fundamentally re-think what their value proposition is, sometimes leading them to explore completely new development avenues outside of their traditional activities. For instance, in a digital innovation age our tennis racket brand’s value proposition isn’t merely selling rackets but helping people get better at tennis. Connected objects and their companion software (in this case the mobile and smart watch app) allow the brand to expand the ways through which it delivers this value proposition in a profitable way. An excellent real-life example of such thinking can be found in Under Armour, which has made strategic investments in a number of fitness applications (the biggest of which being Map My Run) and sees its value proposition as encompassing both sportswear and supporting online services. Our bike brand presents an even more ambitious example of how brands can use connected products to tap massive growth pockets. Through this new bike rental service, the brand can reach a subset of consumers that was previously beyond its reach (car companies are currently following this practice, trying to fight declining car adoption rates amongst millennials with mobile-based car sharing services). This example also demonstrates how the IoT integrates brands into a broader ecosystem, forcing them to connect their offerings with other related products and services. For instance, our bike brand isn’t merely in the biking ecosystem but in the broader health and wellness ecosystem. Acknowledging this, they link up with health insurance providers to offer lower premiums to those healthy users who commute to work by bike. Brands must ask themselves what ecosystem they fit in, who else is part of it, who controls it and how they can link up to other products and services to maximize customer benefits. Connected products are inherently complex. Through sensors, network connectivity, machine learning and other such technologies, they open up a rich array of new functionalities. Too often, however, this comes at the expense of usability. Going back to our smart home research, we heard countless stories of frustrated consumers struggling to install, set up and use so-called “smart” products. Throughout our research, we saw the massive gap that still exists between technology possibilities and UX design approaches. One specific example stood out as particularly representative of the challenges of UX design for connected products. With traditional household appliances, actions are performed through buttons (i.e. turning on or off, adjusting power, etc.). Users get immediate sensorial and visual feedback showing the action has been completed (I know the device is on because I felt the button’s click and can see its change of state). Virtualizing controls removes this feedback and the sense of security that comes with it. Once an analog button becomes a press on a smart watch, consumers often don’t feel secure that the action has been performed properly. They aren’t quite sure that the lights are off or if the air purifier has been turned on. UX design needs to integrate this need for feedback by, for example, providing verbal confirmation or sensorial confirmation through haptic feedback. Brands seeking to develop connected offerings need to put a lot of work into UX design. They must identify the different use cases, be careful not to overwhelm users and provide context-aware interfaces that nudge the user towards the right action and use the right semiotic cues to make complex, abstract actions understandable at a glance. One excellent example of a mature approach to connected products design can be found in how LG ditches complicated stand-alone applications in favor of integration with chat app Line. Users of LG’s smart home products can simply “talk” to their smart appliances through natural language on the same application they already use every day to converse with their friends. This is an excellent example of technology adapting to consumer behavior instead of the other way around. As we’ve demonstrated, when it comes to connected objects, the actual product attributes and features are only one part of the equation. The other part of the equation is linked to the underlying business model; that is, the question of how the brand supports and generates revenue from its new IoT offering. The business model is where the disruptive power of connected products spills beyond technology and user experience. Connected devices are changing the way people access and pay for goods and services in a fundamental way. Brands must think about how best to bundle connected hardware and support software-based services in the ways most compelling to users. This can be achieved through subscription models or pay-as-you-go micro monetization with the hardware being either fully or partially subsidized (much like how our tennis racket brand decided to provide the racket at half price if the user signs up for one year of online lessons). The business model also carries into the distribution model and customer services that support the offering. Working with one of our current clients, it was clear that some of the connected product ideas we were bringing to the table would require our client to bypass its traditional value chain built around distributors and installers. Our client would have to develop direct distribution channels along with in-house installation and customer support services. This represents a big leap for a brand used to operating in the B2B space, but it is a necessary condition to make things work. Whatever answers they bring to the question of business models, brands must not hesitate to go against existing practices. A great connected offering without the right business model is akin to fitting a Ferrari engine in a family van frame. The latter will keep the former from reaching its top performance. Culture — connected objects often require a change in company culture. For many brands this means switching from a culture of hardware and manufacturing excellence to one that integrates software and services. It means growing from pure product performance to looking at the broader consumer experience. This can only be brought about by a change in shared values and incentives that needs to be led from the very top of a company’s management. Capabilities — designing great connected objects requires a considerable breadth of capabilities from hardware excellence (i.e. how do you fit connectivity features into the product without compromising quality?) to software, UI / UX, data analytics, data safety and more. When starting any IoT undertaking, brands must carefully audit where their capability gaps lie and formulate a plan to bridge them, either organically or externally through acquisition or partnerships. Partnerships — we’ve seen with many of our examples how connected objects put renewed pressures on brands to integrate with partners. These partners can be upstream (sensor suppliers, data solution providers, research institutes, design bureaus, etc. ), downstream (distributors, installers, customer service providers, etc.) and can also be providers of products or services in the same ecosystem. Brands must consistently list the partnerships that will be necessary to them and set out early on to strike the right agreements. As we can see, building connected objects offers more opportunities but also more challenges than first meet the eye. Both in terms of strategy and operation, the IoT age will require brands to think holistically, disrupt the status quo and re-think who they are and how they deliver their promise to customers. Many brands will disappear, others will become commoditized but those who manage the transition will see rewards in the form of more diversified revenue streams and stronger relationships with their consumers built around data flows and continuous, agile innovation. The road is long but the journey is exciting and the destination well worth the trip!